The Swift Gamma-Ray Burst Mission just saw something bright in the Andromeda Galaxy. It was either a Gamma-Ray Burst or an Ultraluminous X-Ray Object, but either way it will be the closest event we've ever observed. ...unless it's just a known X-ray object, a programming bug, and a thunderstorm..
Twitter exploded with excited astronomers and astrophysicists.We might have just seen a Gamma Ray Burst from the Andromeda Galaxy. If we did, that's incredible! But to hold on to proper journalist caution: we might not have. Update: It wasn't, instead being a known X-ray source caught by mistake. The story of how preliminary data, a programming bug, and a thunderstorm conspired to lead us astray is still pretty neat. Scroll to the bottom for the rest of the "...nevermind" or read straight through to get the story as it unwrapped in real time. Why would it be exciting? Because it'd be the closest gamma ray burst we've ever observed, yet far enough away to not fry us. Scientifically fascinating without planet-wide extinction! What's not to love? Why the hedging? The data is scarce. An event was spotted that might be a Gamma Ray Burst (GRB), or it might be an Ultraluminous X-Ray Object (ULX). Either way would be exciting, as they'd both be the closest of their type we've ever seen, giving us new, detailed, juicy data. It's very, very, very likely from the galaxy next door, Andromeda, but it could theoretically be from the background space somewhere past it. (I'll get into how confident we are on the location a bit later.) But if you've got access to a telescope and a view of Andromeda, now is a very good time to take a look. The Swift space telescope is dedicated to sensing gamma ray bursts, quickly identifying their location, and feeding that information to Earth so all the other telescopes can scramble to catch up. Swift has been doing great at its mission, spotting about 90 new bursts per year since it launched in November 2004, but this is different. If it is a Gamma Ray Burst, it's from right next door, the closest one we've ever observed. But don't freak out too much: at 2.2 to 2.5 million light years away, it isn't going to kill us. It's just going to be scientifically fascinating. Not very exciting, hey? Allow me to interpret. On the left is the SWIFT BAT light curve data. A light curve is the amount of light emission over time. The burst is that sudden jolt of high-amplitude on the chart. On the right is the SWIFT UVOT image. That's a blend of ultraviolet (UV) and optical (O) telescope images. The event is the blob in the upper left edge. The Burst Alert Telescope (BAT) is triggered by a Gamma Ray Burst, and calculates the position of the burst to within 3 arcminutes. The telescope slews around to target the burst within 20 to 70 seconds. The X-Ray telescope gets a better picture of the burst, getting the position to within 3 arcseconds. Finally, the Ultraviolet/Optical telescope hones in on the position even closer, transmitting a finding chart back to the ground for all the other telescopes to stagger around trying to catch up. Those are a pair of astronomical co-ordinates: RA is Right ascension, and Dec is Declination. Right ascension is the angle eastwards of the venal equinox. Declination is the angle north or south of the celestial equator. Both are listed in terms of degrees, arcminutes, and arcseconds. In terms of conversion, astronomical angular distances work like time: 60 arcseconds per 1 arcminute, and 60 arcminutes in a degree. For context, our sun outputs 3.846×1033 erg/s, so at its source, that event was over 10 million times brighter. Whoa. Update: an error in analysis overestimated brightness by a factor of 300, counting X-rays from all sources in the field of view. That does come with a limitation: Eric Mamajek points out that luminosity assumes that the light was radiating equally in a sphere, spreading in all directions, while this event could have been beaming straight at us. If so, lucky for us to get to see it! But if we saw everything it had to shine in a beam pointed straight at us, it would be a far dimmer event. The Goddard Space Flight Center website went down for part of the night, which impaired their ability to spread new updates. The server went down due to a thunderstorm. Coming on the heels of the National Weather Service collapsing during a storm event, we really need to spend some cash to upgrade these poor systems, please. At 21:24:27 UT, the Swift Burst Alert Telescope (BAT) triggered and located a source in M31 (NGC224) (trigger=600114). Swift slewed immediately to the target. 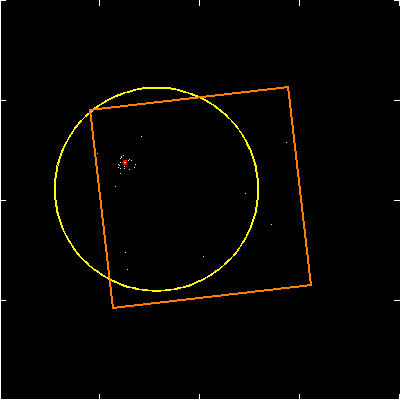 This position is 4.0 arcseconds from that of a known X-ray source: 3XMM J004143.0+413420 in the XMM-NEWTON XMMSSC catalogue. The associated source in the 3rd XMM catalog has a spectrum and variability which is consistent with a low-mass X-ray binary (Stiele 2010). However, the target is also spatially consistent with a globular cluster FMZ2005-7 of M31. There may be multiple X-ray binaries within the same globular cluster. The XRT count rate is approximately 30 counts per second. Assuming a typical conversion factor to flux, the 0.3-10 keV flux is approximately 1e-9 erg/cm2/s (uncertain to a factor of 2x). At the distance of Andromeda, this would be a luminosity of 7e40 erg/s (uncertain to the same factor). This luminosity is clearly super-Eddington for a ~solar mass compact object, so either the object is of ULX class, or it is significantly beamed. with a 90% confidence error radius of 0.61 arc sec. This position is 4 arc seconds from the center of the XRT error circle and consistent with the position of the globular cluster. No correction has been made for the expected extinction corresponding to E(B V) of 0.06. Update: the bold line? Yeah, it was right, and this was from the known X-ray source. If you're an astronomer taking data tonight, you can submit via Astronomer Telegram. How Sure Are We This is in Andromeda? The spacial density of globular clusters in that chunk of the sky is very low. According to Robert Rutledge, the nearest other globular cluster in that patch of sky is at 00:41:46.267, +41:32:18.48, which is more than more than two arcminutes away. Since Swift locates bursts to within 3 arcseconds, it would be very, very weird for it to be that far off. As for this being a burst shining through the galaxy from somewhere in the background? The odds of it being a random superposition are on the order of 1 in 5,000. Put it all together, and that's greater than 99.98% confidence that this burst is originating in the Andromeda Galaxy. I will be very surprised if it's coming from somewhere else. Update: Yes, it is from within the cluster. So, what about the globular cluster the event originated from? Globular clusters are just dense spheres of mostly-older stars. Andromeda has something like 500 of them. The particular cluster astronomers are all wishing they had a clear shot at right now is B045. It's an older cluster, with intermediate metallicity. Metallically is the proportion of all the elements that aren't hydrogen or helium in the star population, even the elements that aren't actually metals. Stars are nuclear fusion devices, building lighter elements into heavier ones. The oldest generation of stars are only composed of light elements and whatever they've fused themselves, while the younger generations of stars built from the remnants of previous stellar explosions get a hand up by starting with heavier elements. Therefore, the metallicity is a shorthand for discussing the general age of the stars, with a higher metallicity indicating younger stars. All that translates into: the event took place in a fairly normal globular cluster, maybe a bit on the wimpy side to find massive black holes. What is a Gamma Ray Burst? Gamma Ray Bursts, or GRBs, are bright outpourings of high-energy particles, gamma rays. They're the brightest electromagnetic events we've ever observed. They end quickly, so all the fuss of observation is on catching the afterglow in other wavelengths. The bursts are typically associated with exploding stars or nuclear fusion, although we sometimes also find them here on Earth associated with lightning storms. If this is a gamma ray burst, it probably isn't from a supernova because that neighbourhood of space just doesn't have many stars large enough to die in a supernova. It's an unlikely-maybe, and coincidentally also the least-fascinating option. This could be a gamma ray burst triggered by the collision between a pair of neutron stars. That would be downright fascinating. If it was, we expect to get a whack of neutrinos detected by Ice Cube. As Alex Witze points out on Nature News, it would also be heartbreaking for scientists trying to detect gravitational waves. A neutron star collision would generate gravitational waves, and from this close we would totally catch them. But, small problem: the Laser Interferometer Gravitational-wave Observatory (LIGO) is currently offline, in the middle of a massive upgrade. Just for them, I almost hope this isn't gamma ray burst spawned by a pair of neutron stars colliding. However, even without LIGO, all is not lost for attempting to detect a gravitational waves. During the upgrade, GEO 600 has been on Astrowatch. If it was turned on and detecting, I have no idea, and if it was, we won't be hearing about it until the team is ready to present data. Until then, if you know someone on the team who suddenly gets very, very quiet about their work, you might want to stock up on champaign flutes. What's an Ultraluminous X-ray Source? If this isn't a gamma ray burst, it could be an Ultraluminous X-ray Source (ULX). If it is, it still won't kill us, but it will still be fascinating as the closest and most detailed look we've had at one of them. Ultraluminous X-ray Source are fairly mysterious, but are probably generated by messy black holes eating infalling gas from an accretion disc. Jay Strader points out that there's a black hole candidate in the area. This X-Ray burst could be from that object suddenly brightening from it gobbling something new. To reach the level of brightness we've observed, we need to turn to Eddington limits. The Eddington luminosity (or limit) is the maximum brightness an object can glow while balancing radiation force pushing out against gravity pulling in. Objects can briefly exceed their Eddington limit (going super-Eddington), blowing away gas with the increased radiation pressure. The increased luminosity is listed as a multiple of the Eddington luminosity, but the bigger a multiple is, the stranger and less likely it is to happen. To match the brightness of this event, it could be a black hole with ten times the mass of the sun exhibiting a ten-fold Eddington luminosity, or a black hole with twenty times the mass of the sun at five-fold Eddington luminosity, or any other multiplicative combination. If this is an Ultraluminous X-ray Source caused by a feeding black hole, it'll take more observations to find out how big that hole was when it flared. Another possibility raised by Laura Lopez and Katie Mack and listed in the bulletin text is that this could be the X-rays from a low-mass binary star system. The X-rays could be from a black hole or a neutron star munching on its more mundane companion. We'll know the difference between the two theories by morning. If this is a Gamma Ray Burst, the X-rays will be gone within roughly twelve hours after the original event. If it's an Ultraluminous X-ray Source, we'll keep detecting X-rays for days or longer. If we spot neutrinos, not only will that be more awesome physics and data that will make many physicists do the giddy dance along with the astrophysicists, it will also pretty much confirm this is a gamma ray burst. We aren't going to know anything more for several hours as we wait to find out if the X-rays fade out or not, and it may take days to get a proper identification. I would love to see how that graph compares with the appearance of #ULXM31 as conscientious scientists realized they should embrace other possible options, even if it meant splitting the hashtag. The Swift telescope saw something, swivelled around, saw X-rays in the right area, reported home, triggered the report, and then the GSC servers went down. Astrophysicists were left with a tiny bit of preliminary data, and no way to update or confirm. This was horrible timing. BAT sensed something somewhere inside the yellow circle (yellow error box). It swivelled, and the preliminary X-ray data was collected (orange XRT view area). It detected an X-ray source (red dot). ...that happened to be a known X-ray object. Once a full analysis was done, our awesome, bright, "What was that?!" source was identified as less bright, and coming from a known object that produces X-rays. They issued a correcting circular telling astrophysicists, "Nevermind!" but by then, the excitement had died down, with astronomers busy at work and those without access to a telescope had gone to sleep or wandered off. We therefore do not believe this source to be in outburst. Instead, it was a serendipitous constant source in the field of view of a BAT subthreshold trigger. How could this happen? All the excitement was based on a preliminary report, then the servers went down in a thunderstorm so we stuck relying on just the data you've seen in this article. A bug in the programming kept the brightness from being analyzed in real-time, producing a brightness estimate combining all the X-ray sources in the entire field of view. With the servers down, the data couldn't be checked and re-analyzed. Swift has a very low threshold to trigger for gamma ray events so that it can detect even faint events far far away, but that means it sometimes get false positives. Usually the false positives are weeded out when Swift doesn't find an afterglow, but this time we got unlucky in that a false trigger coincidentally lining up with an actual X-ray source. Without access to the data to re-analyze, astronomers had to work with only the Swift report. Transient events are, by their nature, well, transient. Some are long lived, but others not. Indeed, this is why Swift exists, to enable us to respond very quickly to the detection of a GRB and gather X-ray, UV and optical data within minutes of the trigger. And Swift is programmed to send what it can of that data straight to the ground (limited bandwidth stops us from sending everything), and to alert the people on duty immediately. The whole reason for this is to allow us to quickly make some statements about the object in question so people can decide whether to observe it with other facilities. This ability has led to many fascinating discoveries, such as the fact that short GRBs are caused by two neutron stars merging, the detection of a supernova shock breaking out of a star and the most distant star even seen by humans, to name just 3. But it's tough. We have limited data, limited time and need to say something quick, while the object is still bright. People with access to large telescopes need to make a rapid decision, do they sink some of their limited observing time into this object? This is the challenge that we, as time-domain astronomers, face on a daily basis. Most of this is normally hidden from the world at large because of course we only publish and announce the final results from the cases where the correct decisions were made. In this case, thanks to the power of social media, one of those cases where what proved to be the wrong decision has been brought into the public eye. You've been given a brief insight into the decisions and challenges we have to face daily. So while it's a bit embarrassing to have to show you one of the times where we got it wrong, it's also good to show you the reality of science. For every exciting news-worthy discovery, there's a lot of hard graft, effort, false alarms, mistakes, excitement and disappointment. It's what we live off. It's science. The entire story, from trigger through Twitter to correction, ran its course in just a few hours. This is a part of doing science in public, and exactly what to expect from preliminary results. The excitement, the What-if?, the theorizing, the analyzing, and, most importantly, reporting the results no matter what they are, is the nature of science. You love science? You love the messy, painful, disappointing bits, too, when your beautiful theory gets crushed before your eyes by the weight of data. It's not as fun, but it's part of the process that leads to glorious discoveries. I love living in an era where science happens in public, where we can hear about potential discoveries when they're happening, but if we're going to let our curiosity draw us to the cutting edge, we need to be ready for the disappointments. The emotional roller coaster of active participation in science includes the exhilarating highs of mysterious data, but also the crashing lows when that data can be explained by the most prosaic process possible. This is normal, it happens, and welcome to the heartbreak that marks the progress of discovery. I'm not deleting the intermediate material in this article because this is exactly why we'd be so excited if we did spot a massive burst from an unknown object in Andromeda, and it very well might happen some day. Swift did exactly what it was supposed to do, astronomers worldwide did what they were supposed to do, and we're ready for a startlingly close gamma ray burst if one happens. Just, you know, not so close as to irradiate us all and kill the planet, please. The Swift team already fixed the programming bug kept the brightness data from being analyzed, which is a bit of rapid-response I'm genuinely envious about. In the meantime, a whole lot of people just learned about gamma ray bursts, ultraluminescent sources, and maybe got a good look at the galaxy next door. That's a lot more productive than most false positives! Show some love to the first to blogs to go live on the topic, Heavy Metallicity and a German-language post at SkyWeek. Feeling hyped up on astronomy and craving more? Check out specials on the self-repairing Canadarm, the Spitzer Space Telescope, the Deep Space Network, monster machines that transport telescopes, or the oh-so-unbelievable true history of rocketry at Jet Propulsion Laboratories.